Despite Ubisoft’s statements to the contrary, the retail release of Watch Dogs was unquestionably “downgraded” in the visuals department when compared to its E3 2012 reveal. 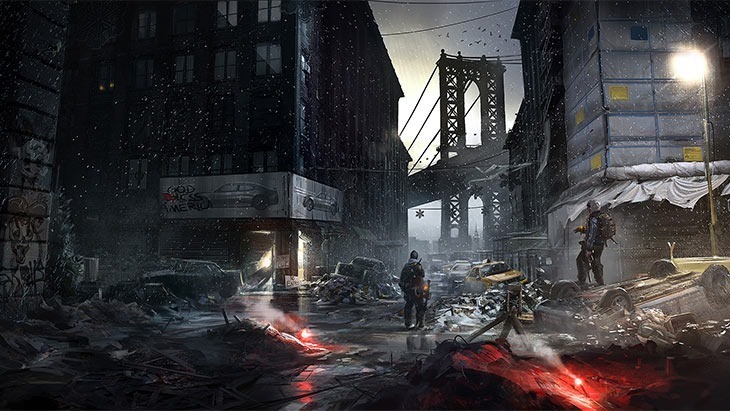 Revealed a year later, Ubisoft’s The Division similarly wowed. And it likewise has many fearing that it too will see a significant drop on visual fidelity when its released. Ubisoft says that won’t be the case. In an interview with Angry Joe, The Division’s Game Director Ryan Barnard said that users shouldn’t worry about any sort of downgrade – and that high end PC’s may in fact end up looking better than the reveal. "We get that a lot,” Barnard told Angry Joe. “I think the problem with having an engine like Snowdrop where the graphical fidelity is so high, that of course you’re going to have those concerns. You know, we’re working really hard, especially this year, what we brought is the look that you’ll have on Xbox One, PlayStation 4 and PC. PC might even be able to push it." This comes before an anonymous, apparent insider has already said that the game’s already been downgraded – so that console players don’t feel like they’re getting the shaft. Mayhaps it’s my head, but what we saw of The Division, other than that incredible, straight-for-the-heart trailer, already seemed to be slightly downgraded from the initial reveal. What do you think? Will The Division look as good as Ubisoft promises? Next article Midweek Mouth-Off: Childhood reboot approved!